All over the world dating back to a distant past structures can be found that used huge stones as building materials. The great pyramid of Giza in Egypt incorporates 2.3 million stones of 2.5 tons each. Inside the pyramid stones weigh up to 50 tons and the stones of the casing, most of them removed for construction projects in Cairo, weigh up to 15 tons. The Egyptians erected obelisks weighing up to 400 tons. 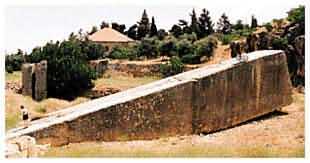 The Trilithon at Balbeek, Lebanon, consists of 3 stone slabs weighing an estimated 1000 tons each. Another slab estimated to weigh 1200 tons was left in the quarry. At Stonehenge, England, a mysterious site consists of circular rows of stones weighing up to 40 tons each. The stones come from quarries as far away as 40 and 230 kilometers. At Tihuanaco, Peru, there are stone slabs weighing up to an estimated 400 tons. Nan Madol in the South Seas was constructed with basalt slabs weighing up to 50 tons. The site is spread over an area of 13 acres. Neither the island of Temuen, where Nan Madol is situated, nor neighboring islands could support a human population large enough to accomplish such an astonishing feat of engineering. These are just a few examples of megalithic sites showing a technology, which is different and sometimes superior to present construction methods. The Romans were the undisputed champions of engineering projects in ancient times. They left no evidence whatsoever that they used this technology. Occasionally, they built own structures like temples on top of existing megalithic foundations like the temple of Jupiter at Balbeek, which was built with typical Roman methods on top of the stone slabs estimated to weigh around 1000 tons each. Similarly, in Peru huge stones were used as foundations for later structures that were erected using smaller stones. Cuzco and Sacsahuaman provide many examples of this method. The above paragraph establishes that the use of megaliths in construction pre-dates more recent ancient civilizations. Many of the megalithic sites remain an enigma as to their use to this day. These witnesses of times long gone by don't talk to us. Attempts to construct similar or like structures mostly failed miserably even using tools of present technology. Therefore, at some point of time there was a cut off date and afterwards megalithic construction methods could not be used anywhere in the world. Probably best researched of the ancient sites is Stonehenge in England. The site started as early as 2900 BC as a wooden construction and underwent repeated modifications. By 2550 a radical change to building with megaliths took place. The site evolved further and underwent major design changes. About 1600 BC all that stopped. Afterwards, there were no changes in the structure. This continued use and the evolution of Stonehenge is a clear indication that this was a place of great significance and importance to people who possessed very advanced knowledge in astronomy. They also knew how to bring heavy stones from far away and how to shape them according to their changing needs. Another site though very different that indicates that a specific situation ended at a certain time is Acambaro in Mexico. In the 1940s Waldemar Julsrud, a German businessman/archaeologist, who previously had made important finds, discovered tens of thousands of figurines made of clay and stone, which to this day present a major problem for orthodox thinking. Many of the figurines show dinosaurs anatomically correct and a good number of them show humans and dinosaurs interacting. Carbon dating of three figurines established 4550 BC as the earliest date. Another date was 1600 BC and the third date was 1100 BC. The Acambaro case is backed by another controversial find at Ica in the Peruvian Andes. Tenth of thousands of etched stones show dinosaurs anatomically correct and some of them are interacting with humans. The Ica stones also show complicated medical procedures like organ transplants. Some of these stones show that the ones performing this type of surgery took precautions to avoid rejection of the transplants. Another set of stones shows people and spacecrafts. The discoverer of the stones, Dr. Cabrera, found humans remains together with plants as they existed in the Mesozoic. Furthermore, there are stones showing people looking at a comet through something that one can clearly recognize as a telescope. - None of all that can be found today. There are no people among the native population performing complicated surgery. There are no dinosaurs and there is no trace of Mesozoic plants. Most puzzling of the finds at Ica are several stones with etchings of this planet's surface. The continents can be recognized but their locations are shown as they were 13 million years ago. Even more puzzling are two large landmasses to the left and right of the American double continent. These don't have any counterparts in the present world. Their locations correspond to reports from ancient times that in the Atlantic there was a continent or a very large islands called Atlantis and in the Pacific there was a continent called Lemuria or Mu. 5 centers of civilization - Egypt, Sumeria, the Indus Valley Civilization, Japan, and Peru, practically simultaneously appeared all over the planet approximately 5500 years ago. From that time on religious systems were implemented. Gods and deities controlled the lives and destinies of humans. We know from many accounts in Sumeria and Greece, for instance, that there was all kind of interaction between gods and humans. The Greek gods freely mixed with humans and unions between the two species produced children who were called demigods. - All that ended abruptly. Around 1500 BC a major cataclysm struck this planet. The island of Thera exploded n the biggest volcanic eruption of the last ten thousand years. This event devastated the entire Mediterranean. The ensuing flood is called Deukalion's flood because he and his wife were the only gods to survive the disaster. Deukalion and his wife were born from unions between gods and humans and this probably was the reason that they survived. If we discard the 1100 BC dating of one Acambaro sample as a dating error or the work of an artist who continued a local tradition we have the cut-off date we have been looking for. From approximately 1500 BC no more megalithic structures were built. This date also tells us that the ones who used the megalithic building methods were not humans but gods, a race of humanoids that had invaded this planet approximately 5500 years ago and vanished approximately 3500 years ago. Ancient text from Lebanon report that the god Uranos was able to move heavy stones as they can are found in the Trilithon of Balbeek as if they had a life of their own. Of the huna, the little people of Hawaii with wondrous powers, it is reported that they had flying crafts and they could float heavy stones underneath these crafts without any visible connection. An Egyptian construction crew consisted of a deity carried by four men on a litter and a second litter with a huge round disk. Additionally, there were a number of humans and a baboon keeping watch over the humans. Remarkably, most of the images and sculptures of gods and deities show they are wearing many different kinds of headdresses. One very popular design has a round disk in the middle. Others headdresses seemingly have antennas or look like elongated hats. Many years ago a Slovac research team investigating psychic powers found out about mind enhancing devices. These enabled the psychically gifted test persons to perform much better in telekinesis or levitation. Though modest in scope these tests showed very clearly that the possibility to move things with the powers of mind does indeed exist. The finds at Ica and Acambaro irrefutably show that this planet must be home to two totally different worlds. In our world there are no dinosaurs and no gods or deities. In the world shown on the stones of Ica and by the figurines of Acambaro there are gods, dinosaurs and humans co-existing. This parallel world that came to an end approximately 3500 years ago obviously experienced a totally different evolution. Mesozoic plants, dinosaurs and gods are proof that this parallel world is so different from ours that we simply have no clue what else there could be. We only can assume that in this world also the capabilities of the mind can be very different from the ones in this world. In our world some unusually gifted people are able to demonstrate with modest success that telekinesis and levitation exist. In the parallel world the powers of the mind could be tremendous. Nowhere in ancient pictures or sculptures we can see heavy construction equipment similar to what we use. What we do see just about everywhere are these headdresses suggestive of mind enhancing devices. Therefore, the conclusion is obvious: these gods and deities of the former parallel world used the powers of their minds to telekinetically levitate the heavy stones. If there were humans involved in the processed they were just helpers who had to make sure that the stones fit exactly in the right spot. There are people who can bend spoons and move little objects over a tabletop with the power of their mind. This is a very far cry from moving stones weighing up to a 1000 tons with mind power. Aside from the possibility that the parallel world permits evolution, which differs radically from our world, a method must be employed that allows a different, more efficient approach to moving heave objects with mind power. Our cranes lift heavy loads of material. But the lifting is not only done with matter. The movement of the lifting takes place in the energy phase of matter. This needs an explanation. - Matter oscillates between the stages of matter and energy. Movement takes place in the energy phase and is expressed in the ensuing matter phase as the new oscillation shows a slightly different location where the materialization takes place. These continuous matter oscillations express the movement experienced in the energy phase. They also create time as the successive matter oscillations express the passing of time. - This is similar to a movie where the appearance of one frame after another conveys the impression of movement and the progress of time. takes place in the energy phase the weight of the material to be lifted is felt. But matter has a different type of energy attached to it: the energy behind matter, which is different from the energy that is the energy phase of matter. This energy is known to science as the quantum vacuum. Other names like ether are used, too. But this energy is better known as the spiritual energy. In the realm of the quantum vacuum there is no time and no space. Without space there is no weight. Therefore, to move heavy objects with the power of mind one has to address weight lifting in the energy of the quantum vacuum that corresponds to the load to be lifted. Space travel over distances of millions of light years cannot be done in the normal time/space continuum. To get somewhere in space one has to go through the quantum vacuum where there is no time and no space. This is the only way to efficiently travel through space. The fact that the gods invaded this planet 5500 years ago shows they knew how to deal with the quantum vacuum. Presumably, it is much easier to utilize the energies of the quantum vacuum for lifting weights than to travel through space. Conclusion: the gods knew how to address the energies behind matter to move heavy loads. They made these loads weightless by telekinesis and floated them through the through the air by means of levitation. "They made the stones look as if they had a life of their own". Neither transporting these super heavy stones over sometimes great distances nor putting them in place was much of a problem for the ones who knew how to make them weightless. Another mystery to be solved is the smooth surface and the perfect fit of the megaliths. - People who have a good enough command of the quantum vacuum to master space travel surely know how to use energy for cutting stones. Science fiction movies show radiation weapons that cut opponents apart or make them disappear. Cutting stones this way is not much different. Radiation weapons or cutters emit energy, which undoes the energy contained in the atoms it hits. In other words: take away the electromagnetic charge of an atom and it collapses. Direct a beam of energy that neutralizes the electromagnetic charge of the atoms it hits and matter will turn to dust. The perfectly shaped blocks used in the construction of the pyramids of the Giza Plateau indicate that they were processed in the quarry and then transported to the construction site. At Cuzco and other Andean places stones of different shapes were cut and smoothed on location to a perfect fit. Thus, the megaliths probably were less of a problem to handle and use than contemporary materials. Having established who was erecting the megaliths and how it was done the big question remains: "what for"? Many of these structures seemingly have no practical value. The key to this mystery is the pattern of behavior of the gods. Most of all temples were important to them. This clearly indicates that the foremost consideration for them were energies, the spiritual energies channeled to them through religious practices and rituals. Consequently, one has to assume that other megalithic structures served same or similar purposes: to connect to the energies of the quantum vacuum, the spiritual energies, and achieve something to ones own advantage. The most significant megalithic structures are the pyramids of the Giza Plateau. Their sheer weight and the incorporated data eclipse any other structure on Earth. Interestingly, they do not stand on their own. They are arranged in the same pattern as the stars of Orion's Belt. The other pyramids in Egypt are arranged in the same pattern as the stars in the star cluster of Orion. Beyond that there are many megalithic structures throughout England and Europe. Arranging these megaliths on a chart and bending the chart results in a replica of the heavens above. The Pyramid of the Sun, of the Moon and a third, smaller one in Teotihuacan, Mexico, are arranged in the same pattern as the three pyramids of Giza. The Pyramid of the Sun has the same basic measurements as its counterpart in Egypt but its angle of ascent is shallower. Therefore, it weighs a lot less than the great pyramid of Giza. However, there are other pyramids of the sun and of the moon throughout Mexico and Yucatan. Together, they probably form a spiritual unit, which was meant throw the weight of the sun and the moon into the spiritual equation of the gods of the Americas. Incorporating the heavens into one's own equations of spiritual significance makes it clear that the sheer weight of the structures representing one's spiritual claim makes all the difference. The more mass is backing one's claim the greater is it's spiritual force. Therefore, the gods built superheavy structures to gain spiritual superiority over rival gods. Megaliths were in with the gods. Once they were gone megalithic building methods were out.